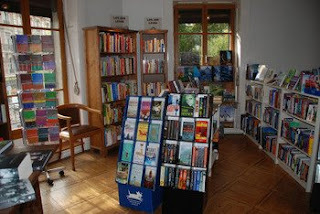 Alex said: "I want to recommend you a bookshop in Geneva. Its name is Off the Shelf and its location is interesting (above a German bookshop, next to a French one - it's like a Drei Länder Punkt - a border with three countries) near the University. The prices are real friendly to your pocket. Also important to know that prices are in Swiss francs (1CHF ~ 0.65 EUR)." Switzerland, being a multilingual country, has an abundant offer of bookstores whose stock consists of German, French and Italian books. When it comes to English books, on the other hand, many of the Swiss bookstores do have a small selection of English titles but, for some reason, purely English bookstores are not that easy to find. Therefore, Off the Shelf is the real precious stone in Switzerland. 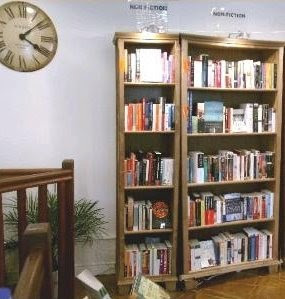 Off the Shelf is a small but very cozy bookstore with a very friendly service - the staff is known to often engage in conversation with the customers, discussing books and new releases. With a nice stock, Off the Shelf also has a cute children's corner i.e. kids room where, besides reading, children can spend the time playing, while their parents are browsing for their favorite books. They also offer a delivery service and are willing to track down that one copy of an out-of-print book that you desperately need. Furthermore, they have a special cooperation with the University of Geneva and, beside stocking textbooks students might need, they also provide students with a special card where, by purchasing a book, they collect points which they can later on use as a gift token. What's more, the bookstore is located only a few hundred meters from the university. Located in the center of Geneva, in the Plainpalais area, Off the Shelf, an all-English language bookstore stocks books in all genres - both fiction and non-fiction, children's books, English language teaching materials and simplified readers, as well as American and Swiss magazines. Thanks to its carefully picked stock, the bookstore has earned a reputation of the best source of English books in Geneva. Interesting readings and book launches also take place at Off the Shelf, you can check out a list of the previous ones and the announced ones on their website. i love your blog. it took me weeks to find an english bookstore in geneva. i even found a portugese bookstore first near gare cornavin. finally finally found off the shelf with its cute wooden staircase when a friend from a nearby french town gave me specific directions. would have found it faster if i had read your blog. Sadly, when I looked for it last year it had closed. If it's to believe their web, they are still in business. Has anyone visited Off the Shelf recently? This is just a follow-up comment to a question posed about OffTheShelf bookstore in Geneva, Switzerland ( original post here: http://www.bookstoreguide.org/2008/12/off-shelf-geneva.html). I can confirm that OffTheShelf is still very much in business as the University of Geneva’s English department orders a lot of books through them for our classes. Our student journal, Noted, will be publishing a short interview with Helen, the owner, in the spring edition so if you’re interested, I’ll send the copy to you when I have it.